Founded in 1999 by a group of Jewish philanthropists led by billionaires Charles Bronfman and Michael Steinhardt, the Birthright Israel Foundation began with a simple idea: Give Jewish young adults between the ages of 18 and 26 the opportunity to visit Israel on all-expenses paid, 10-day educational trips. To date, over 500,000 have taken advantage of this boon to explore their Jewish identity and connect with the people of Israel. It can be a powerful experience. Trip highlights include a visit to Masada, the last Jewish stronghold against Roman invasion. Another must-see is the Wailing Wall, a limestone vestige of the temple in Jerusalem that was destroyed by the Romans in 70 A.D. The wall is the holiest place where Jews are permitted to pray, a site of pilgrimage for centuries. But maybe most resonant for participants are the many opportunities on Birthright trips for participants to bond with their peers in Israel. Birthright Israel has attracted steady criticism over the years for its boosterism of Israel and Zionism, including by some Jews. But it has kept growing, enlisting new generations of participants anxious to visit Israel. This operation is expensive. The trips average around $3,000 each, and the budget of the Birthright Israel Foundation in 2015 was about $95 million, according to its annual report. Who pays for all this? The foundation's president, David Fisher, explained: “When the program was started, there were going to be three fundamental partners: the government of Israel, the organized Jewish community and then philanthropists, roughly a third, a third, a third." During the first seven or eight years, the founders' seed money played a big role in scaling up the organization. Over time, though, more major donors entered the picture. "After a few years, it was a few hundred donors then a few thousand donors,” Fisher said. These days, the Israeli government contributes about $40 million a year. Another large chunk of the group's funding comes from the Jewish community. Fisher said that most of its donors "are here in the states, but we have funders all over the world." 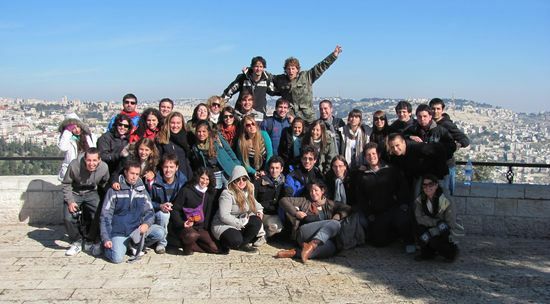 Alumni of the trips are key to fundraising, and a great many of them give annually to the Birthright Israel Foundation. "We are building that base where they are giving $1000, $2000, $3000," Fisher said. Fisher described a development operation that includes people around the United States, who are in "communities working one-on-one, having dinners having parlor meetings in people’s homes. We find a very effective tool for us is bringing in an educational resource from the program, maybe someone from Israel and having roundtable presentations in offices in certain industry sectors around lunches, breakfasts—trying to meet donors when and where it’s convenient for them." Some of these donors open their checkbook in a very big way. "We have individual donors who give us as much as $2.5 million dollars a year, lots of family foundations," Fisher said. In recent years, the Shimon ben Joseph Foundation, the Marcus Foundation, the Schusterman Family Foundation, the Steinhardt Foundation, the one8 Foundation (formerly known as the Jacobson Family Trust), and the Klarman Family Foundation have donated a million dollars and more. The biggest funder of all to Birthright Israel has been the foundation of Sheldon and Miriam Adelson, which has contributed over $200 million to the organization since 2009. Jewish family foundations have proliferated in the 16 years since Birthright Israel was founded, and the organization's development staff works hard to cultivate these organizations. Its foundation relations program leads an effort that pulls in about $20 million a year from what Fisher described as "foundations that operate with a professional staff under professional leadership." Birthright Israel also runs a direct marketing program, which is enormously successful, raising $2.7 million last year. Fisher said the cultivation of bequests is an emerging area, along with plans for an endowment. He said the foundation so far has commitments of $100 million, but hasn't yet received any of that money. A big advantage Birthright Israel has in fundraising, Fisher said, is the specificity of its niche and "ever improving its product and its program." The organization has also made a big investment in tracking its results. "One of the biggest selling points we have is our ability to show and demonstrate impact, measurable consistent statistical impact," Fisher said. "We have been measuring the impact of the program since the beginning. We know now, 16 years later, the kind of the impact the program has had, how participants have engaged in Jewish life three, five, 10 years after their experience." That's powerful in an era when more donors are keen to give effectively. In this case, though, the metrics matter less than the deeper emotional resonance of what Birthright Israel seems to deliver to participants. "The program engenders an understanding and acknowledgment of where the Jewish people have come from and what our story has been as a people," Fisher said. What Does Kathy LeMay Know That Other Fundraisers Don't? Why Is It So Hard to Find a Development Director? And What Are the Solutions?